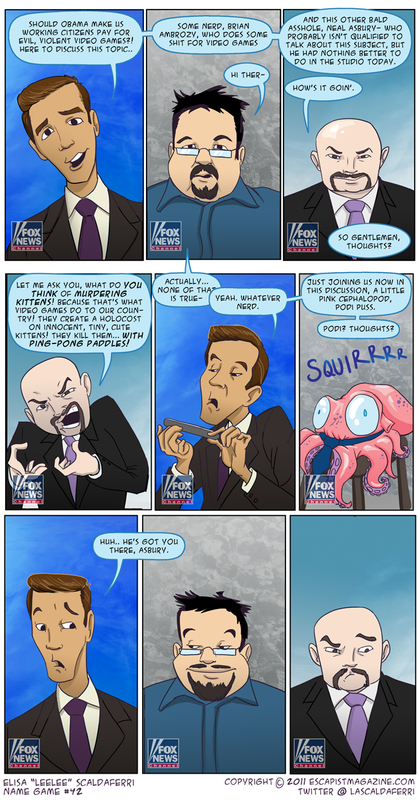 The only time I question the right to Free Speech is when I watch Fox News, probably due to the fact that I don't think they really believe in it. If you haven't seen the lovely news coverage they did on the NEA and Video Games last week, let me provide you with some back story. I felt so unbelievably bad for poor Ambrozy. I have to give him a lot of credit. He had to have known how they were going to treat him. This isn't to say that I'm annoyed with the fact that Fox News doesn't approve of games getting federal funding. I expected that. What I'm annoyed with is how they clearly didn't do any research at all. If they even skimmed the NEA guidelines, they would have known that Call of Duty was not one of the games that qualified for funding. I'm appalled with how they get away with reporting on news without doing research. You would think they would have to go through some approval if it's getting aired on national TV? I also can't tell you how loud my face-palm was when Asbury brought up that ridiculous Ping-Pong defense. Their lack of respect is downright disgusting. Since this happened last week, and it's been a while since Podi was in a comic (not just in the background), I figured it was time for him to break out his debating skills again. That is his strong point, of course.